Once again this years' trip was organised for Members of the Asociacion Menorca Britannia by Gundi of Viajes Sant Lluis from proposals made by our President, Bryce Lyons and the Asociacion’s committee.Sunday 17th March Arriving at the small airport of Jerez we transfer by coach to the centrally-located SOHO Boutique and Spa hotel. 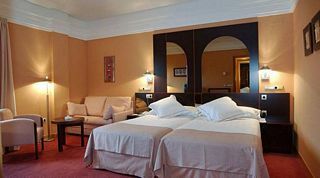 On our way to the hotel we experienced for the first time what was to become, for many of us, the lasting memory of Jerez—the scent of orange blossom! 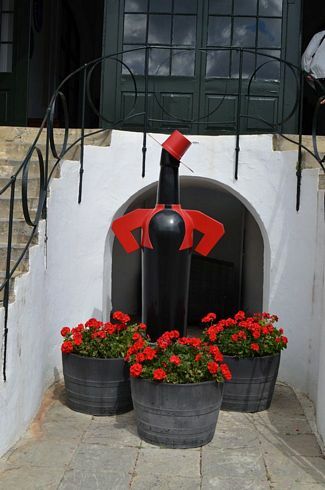 Spring was much in evidence when we arrived in Jerez de la Frontera and preparations were already underway for the anticipated crowds to attend the Easter week festival in April and the famous Jerez ‘Feria del Caballo’ from May 11th – 18th 2019. In the haberdashery shop- windows were framework structures for the tall conical hats (Capirotes) worn by the brotherhoods at Easter. In readiness for May, authentic Jerez outfitters sported rails of the beautiful (and expensive) flamenco gypsy dresses and embroidered fringed shawls for the girls and the ‘macho’ riding outfits including the familiar hats and extravagantly decorated riding chaps for the boys. More extravagant yet were the accoutrements for the horses sold at the Saddleries around town – all the standard equine equipment together with decorative additions including embroidered knick-knacks, colourful pom poms and ribbons. Left with free time for the remainder of the day we explored the local area and experienced some local food (relatively cheap) at the amazing restaurant, Casa Sanchez, a converted whisky warehouse around the corner, originally built in 1860 and converted to this fabulous venue just 5 years ago. Yes, whisky – apparently Scottish whisky from Speyside is shipped in tanker lorries to be matured in old wooden sherry barrels. 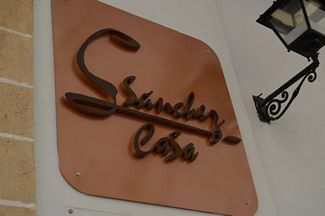 Later in the week this particular restaurant was to provide the lasting memory for one of our party – the best steak he had ever eaten! 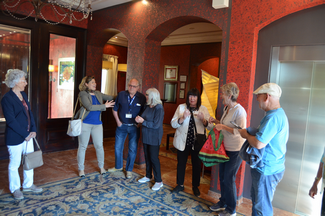 On Monday we were collected from the hotel by a coach and introduced to our guide – a delightful French lady called Cécile who came from Brest which is twinned with Jerez de la Frontera. Despite not being a local, Cecile proved to be an entertaining, impressive and very knowledgeable guide and companion. We admired countryside and the distant mountain range en route to Cadiz – our first destination. The wetlands approaching the city are a twitchers’ paradise with all manner of migrating bird species including flamingos, egrets and storks. We approached the busy dock area of the city across a magnificent suspension bridge of mammoth proportions only completed in 2015 - 69 metres in height! Cadiz is a city dedicated to the sea. It’s thought to be one of the oldest cities in Europe, originally founded in 1100BC by the Phoenicians. It’s been occupied and re-occupied over the centuries. It became a naval base for the Romans, the Moors settled there and most recently it was invaded by the British and French. Perhaps that’s why there are the remains of fortifications pretty much everywhere you go. We admired parks and gardens and monuments and wandered the shady narrow streets of the old town – long narrow cobbled lanes of tall town houses and palaces opening onto generous, often leafy, squares. 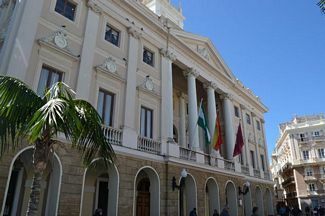 The beautiful Cadiz City Hall. 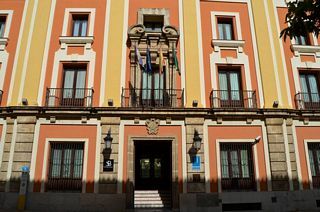 In 1806 this is where Admiral Collingwood and his Captains were invited to a Banquet arranged by the Conde de Solana, Governor of Andalucia in recognition of the humanity they had shown saving hundreds of Spanish & French sailors following their defeat at Trafalgar. Finally we had an interesting tour of one of the city’s cathedrals – there are two! The famous composer Manuel de Falla is buried in the crypt. Then back on the bus for a leisurely drive ‘home’ through bull-rearing countryside, inhabited also by giant modern windmills taking full advantage of the Levante coastal breezes. We passed large pine forests and were surprised at how green it was, being so far South. 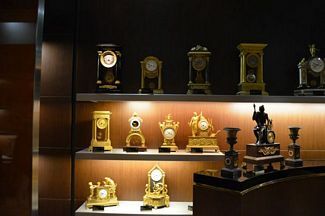 The Museum of mostly English and French clocks dating from the 17th, 18th and 19th centuries is housed in a Palace set in extensive English gardens. Originally built in the 19th century as a large house by a British Officer but later extensively enlarged by a Spanish gentleman merchant. The Palace and the collection of more than 300 clocks were (allegedly) reluctantly donated to the Nation by an infamous tax-dodger. We were told that a chap is employed to wind them all up each day before 9.30 and that most maintained the correct time – a fact proven when at 10 o’clock they all started to chime!! Then we walked on to “Real Escuela del Arte Ecuestre” where we had privileged seats at the famous show of dancing horses. It was a spectacular event – excellent and faultless – although we remain stubbornly loyal to our own Menorcan horse shows at Son Martorellet!!! Following this wonderful show of horsemanship it was on to the Museum of Equestrian Art and the Carriage Museum – both amazing especially the Carriage Museum which proved to be another highlight for one of our party. 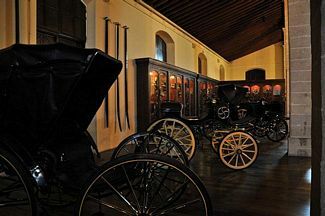 Giant warehouses displayed every sort of carriage, each one in pristine condition, works of art, items of beauty yet completely functional – even a Royal carriage ….. plus an unexpected peek into some stabling with real live horses. Then an afternoon to ourselves although we lingered in the carriage museum until 3.00pm – closing time! 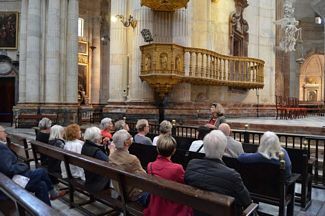 On Wednesday we were treated to a walk around Jerez de la Frontera with our guide, Cécile – but first a song ……. “Happy Birthday, dear Bry-yce. Happy birthday to you”. The group were delighted to share a very special birthday with the Asociacion’s President, Bryce Lyons. Bryce, Very surprised and embarrassed on his special birthday The group and guide Cécile on his right. How generous of everyone! We enjoyed a leisurely walk around the old quarter of Jerez seeing Christian, Moslem and Jewish elements of the city. Already the seating booths were being erected and spruced up for the Easter processions. Cécile coped heroically with our straggling crocodile through narrow streets, big squares, pointing out items of interest. Jerez has 22 churches including a Cathedral. We visited cloisters, the Alcazar and the Arab Baths. We saw gardens, monstrous trees, galleries, shops and sculptures. 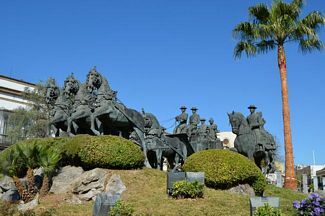 We admired in particular a beautiful life-sized bronze sculpture depicting a typical scene of the famous Jerez Feria – a carriage drawn by five lavishly tassled horses carrying a group of folk on their way to the Feria together with a horseman and his side-saddle Senorita –wearing the exotic flamenco-style costume. This for more than one of our group is the lasting highlight of the trip. 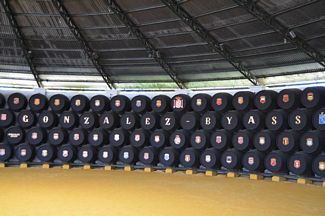 This tour confirmed that, whilst Jerez is a fairly large place, the centre is compact. The walls and defence structures illustrate why its name is Jerez de la Frontera – a hark back to its troubled past as the frontier to invasions to Moorish invaders. After a brief coffee break, we scampered around the covered market and were astounded by the piles of fresh fruit and vegetable produce, the beautifully prepared fish, shellfish and meats of all types. The speciality produce of the area is fish, beef, vegetables - particularly peas and beans, and game including boar and rabbits as they have the sea, mountains, pine forests and countryside all at hand. Another highlight for many of us - we then visited the Gonzalez Byass Winery, the Tio Pepe Bodegas where we were welcomed by our guide and taken on a train ride around the expansive operation. The local white chalky soil provides ideal growing conditions for the Palomino, Pedro Ximenez and Moscatel grapes which produce a wine which is then fortified in a number of ways to produce a range of sherry types. The word ‘sherry’ is the Anglicisation of the word Xeres (Jerez) and is restricted to wines produced in the ‘Sherry Triangle’ around Jerez. The actual pressing of the grapes takes place off-site but we were shown around a series of vast high-ceilinged storage ‘houses’. Barrels made of North American oak are piled three deep directly on a sandy floor in a system called ‘solera’. 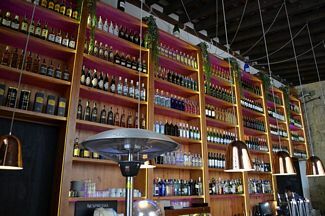 The wines are aged and blended before being sold around the world. The bouquet as you walk into these storage areas was a highlight memory for several of us. We were also amused by the custom that has grown up where visiting celebrities are invited to autograph a barrel. There were signatures from around the world, scores of them – including the past and current Kings and Queens of Spain, HRH The Duke of Edinburgh, Ayrton Senna, Cliff Richard, Michael Portillo, Fangio, Churchill, Steven Spielberg, Robert Wagner etc. We were invited to sample the products and were treated to a display of sherry-pouring by an expert sommelier using the famously long-handled cup (a venencia) – another highlight memory. On Thursday Cécile escorted us for a full day excursion “La Ruta del Atlantico”. 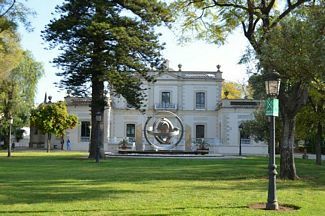 Once again our coach took us South of Jerez, this time skirting Cadiz on our way to the Southern coast on the Atlantic and we were able to admire again the countryside and birdlife of the area. We stopped for a coffee (politely refusing the local breakfast of a flavoured lard on toast) on the banks of the Barbate river below the hilltop town of Vejer de la Frontera. We travelled on and Cécile explained to us that the coast of this region is directly on the route of the migrating tuna fish. To this day its economy is virtually exclusively dependent on this. Since ancient times it has featured and it is one of the main reasons that the Roman town of Baelo Claudia was built. 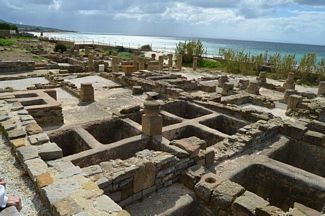 Now, the extensive ruins of the town are situated some 15km north of Tarifa, by the small town of Bolonia and its beautiful beach. The sites' important history also rests on the former city having been a strategic point for trade routes between Europe and North Africa; the Straits of Gibraltar are just 14km wide at their narrowest point, and Baelo Claudia profited from this proximity. We walked around the remains of the impressive temple, Forum, basilica, baths, aqueduct, and large fish-salting factory chased by a threateningly black rain cloud. Fortunately it held off long enough to allow us to see it all and admire the view towards the coast of Morocco. 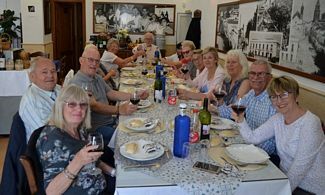 We climbed back onto the coach as the rain started and headed towards the restaurant El Mirador de Barbate overlooking a beautiful beach. The sun came out again and the tuna tasted wonderful!! We then headed west to Cape Trafalgar and struggled to imagine the carnage of that battle. The view today on a sunny afternoon with an expanse of golden sand and an idyllic turquoise sea buzzing with scores of colourful kite surfers wasn’t what any of us expected. 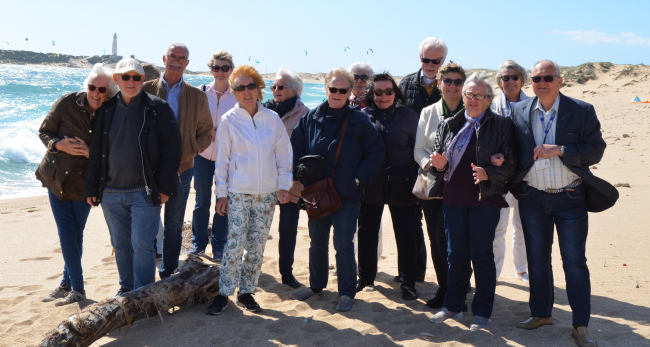 After the group photo on the beach we headed 15 kilometres North East to the hilltop fortress of Vejer de la Frontera, through the beautiful pine clad coastal natural park of Las Brenas. The town of Vejer de la Frontera occupies a low hill overlooking the Straits of Gibraltar and is surrounded by orchards and orange groves. It contains several ancient churches and convents, and the architecture of many of its houses recalls the period of Moorish rule, which lasted from 711 until the town was captured by Saint Ferdinand of Castile in 1248. Agriculture and fruit-farming are the chief industries; fighting bulls are also bred in the neighbourhood and a running of the bulls is held annually. We are now fully conversant with the layout of these famous white villages – it’s all uphill! Our instructions usually were “Just continue up the slope” OR as our adorable guide pronounced it “the slop” (sorry – an ‘in’ joke). One ‘slop’ in particular was well worth it, as it led to a lovingly maintained enclosed patio garden which was a mass of colour even at this time of year. And the view from the top when we finally arrived was spectacular. And a final comment. To help assemble this review, each member of our party was asked to submit what for them, was the lasting memory of our trip to Jerez. The overwhelming majority said it was the camaraderie of the group. How lovely is that! Written by Annie Roberts Additional historical comments by Bryce Lyons Photographs courtesy of Steve Morgan PS Already we are considering the Menorca Britannia Adventure next year. A two centre visit to Bilbao and La Rioja. If you are interested in joining us, keep the dates free of 29th March to 3rd April give or take a day or two either way.